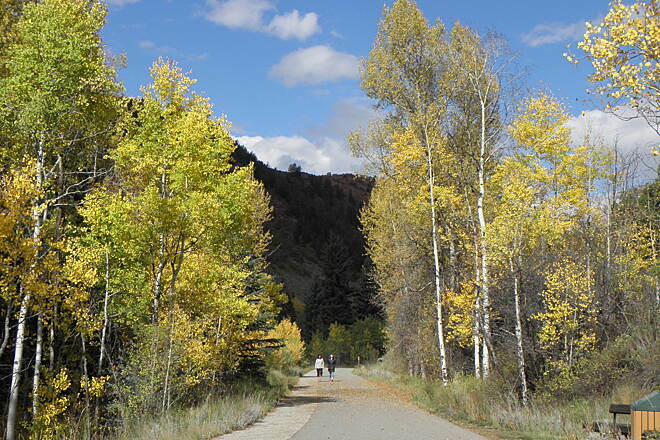 Colorado's Rio Grande Trail is built upon the Aspen Branch of the former rail corridor of Denver and Rio Grande Western Railroad (D&RGW). Trains stopped running between the 1960s and the mid-1990s, after which the corridor was purchased by a cooperative of local government entities and organizations. 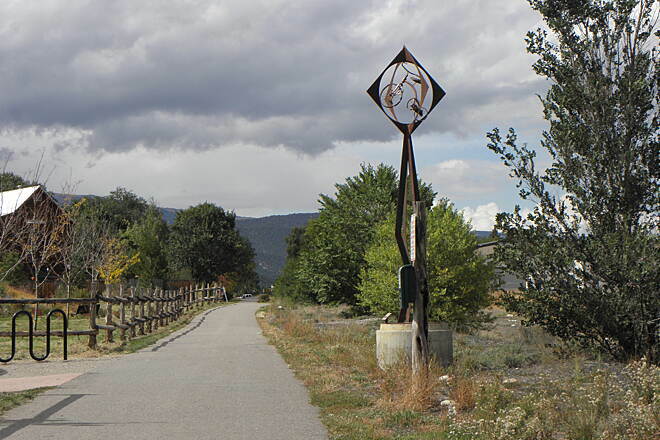 The Roaring Fork Transportation Authority was created in 2001 to, in part, help manage the trail. 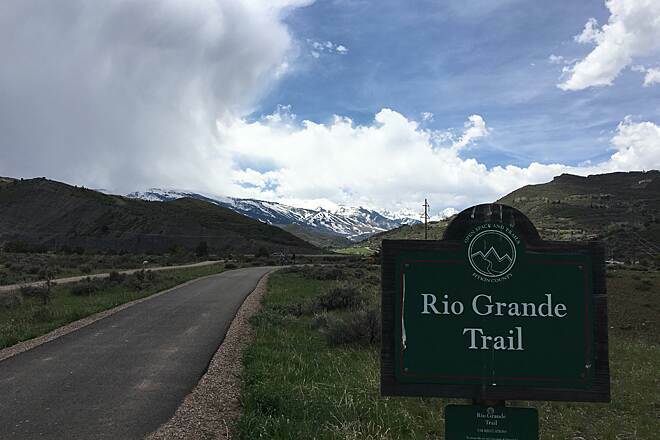 From Glenwood Springs to Carbondale, the Rio Grande Trail follows the course of the Roaring Fork River, nestled between the river and Route 82 before heading east to continue paralleling Route 82 to Aspen. 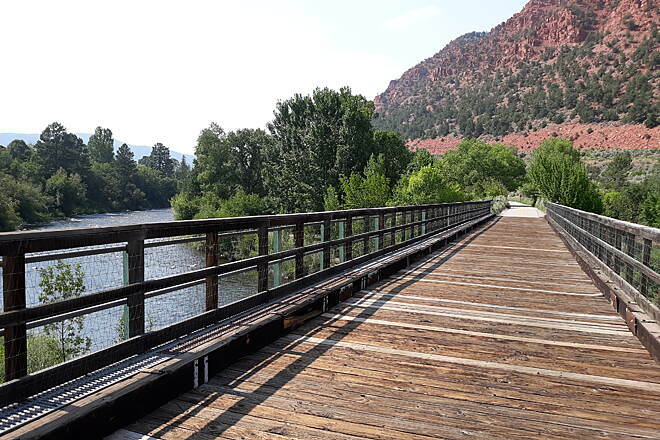 In Glenwood, the trail also connects to the equally stunning Glenwood Canyon Bike and Pedestrian Path. 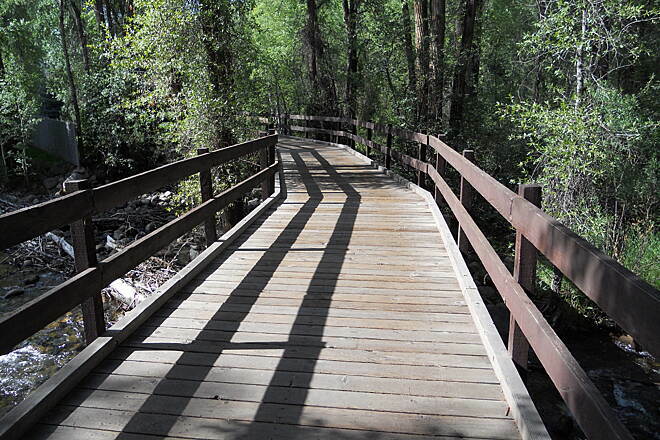 Trail users will find a scattering of picnic tables and benches along the route but there is no potable water. Vault toilets are found at various places. 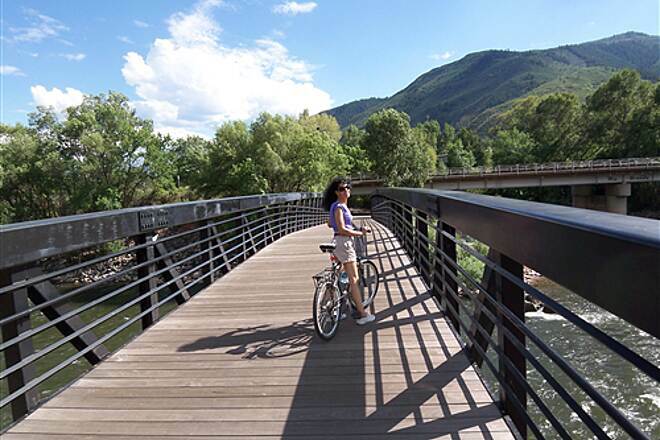 For those wishing to bike portions of the trail, you can also take an RFTA bus to and from various trailheads between Aspen and Rifle; bike racks on the buses are provided. You will have to pay a nominal fee to bring your bike in addition to the bus fare. When winter snowfall exceeds 3 inches, the trail is plowed between Glenwood Springs and Main Street in Carbondale. Certain other sections may be groomed for cross-country skiers. 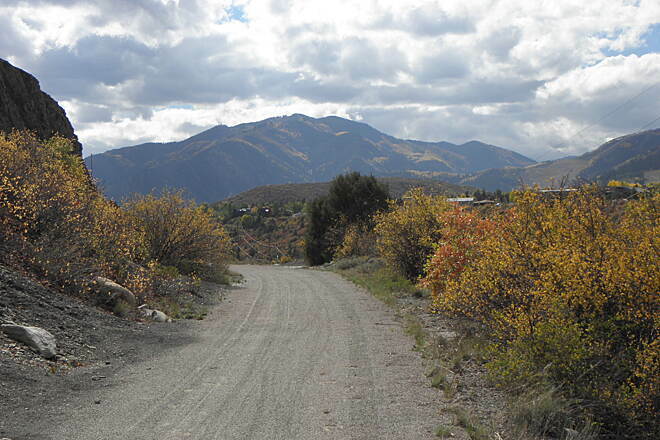 SEASONAL CLOSURE: To protect wintering wildlife, the Rio Grande Trail between Rock Bottom Ranch and Catherine Bridge closes seasonally from November 30 to April 30. A detour route is noted at the Hooks Lane and Catherine Bridge trailhead parking lots during this time. The detour is along county roads. The closure applies to all trail users, including anglers and hunters. In addition, dogs are prohibited on this section of the trail year-round. 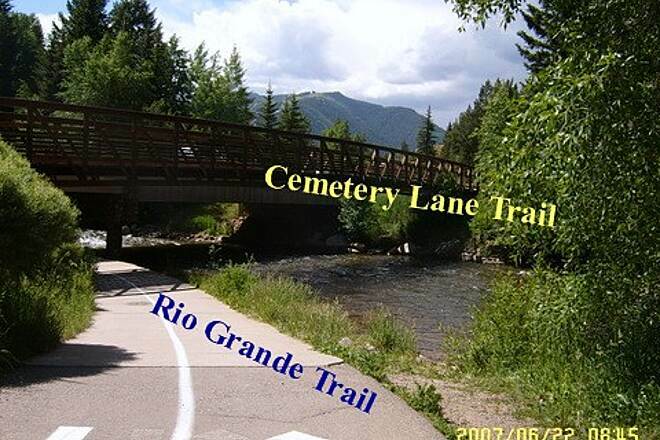 The Rio Grande Trail can be accessed from several places along its route. For more detailed information about the location of parking and access, including bus service routes, refer to links under Related Content to the right. 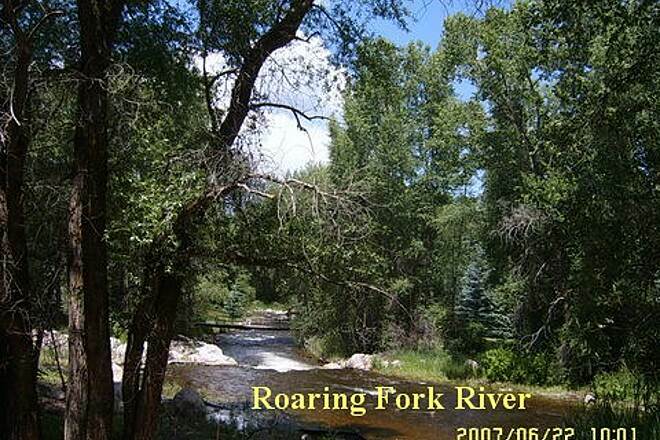 I think this trail should be called the Roaring Fork Trail. The Rio Grande River is is about 100 miles away. It's a beautiful ride, albeit gets pretty busy down near Glenwood. Two years ago we rode uphill from GWSprings to Carbondale, and glided back downhill to GWSprings. This year we decided to take the shuttle offered by Glenwood Adventures. $39 includes bike rental. They dropped us off in Carbondale, and first we rode uphill to almost Basalt to get in a little pedaling, then turned around and glided all the way back to GWSprings. About 35mi total. We considered taking the RFTA bus, but there were 3 of us, and the bus bike racks only hold 2 bikes. The website also says first come-first-serve, and this was a peak season Sunday, so we didnt want to risk it. We needed to rent bikes anyway. The Glenwood Adventure shuttle was great, as were the bikes (21 speed city bikes in good shape). Included handlebar bags and helmet. 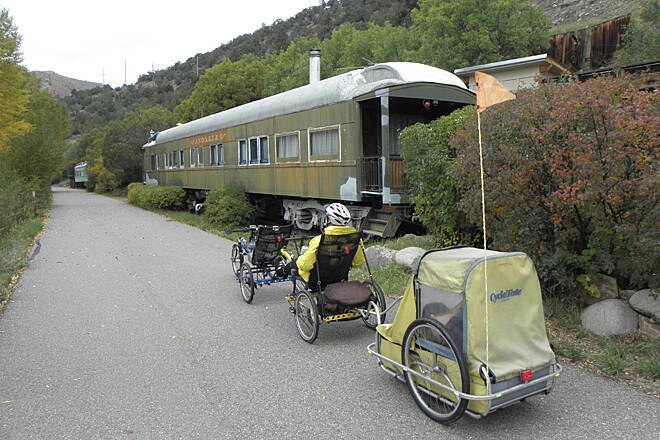 As it turns out, we saw many RFTA buses with no bikes on the racks, so next trip, if we have our own bikes, we will park in GWSprings, ride the RFTA bus to Aspen, and 'glide' back to GWS so we can see the whole trail end to end. In Carbondale, Fatbelly Burgers is a good stop 1 block off the trail. Hotels in Carbondale are more affordable than the ones in GWSprings because of canyon rafting in GWS. Enjoy this gem! 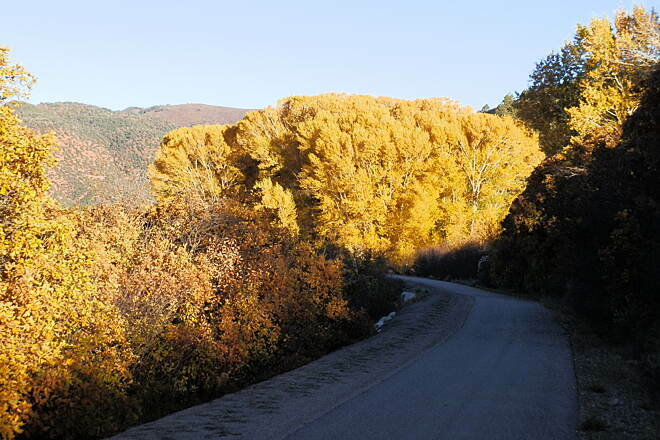 A beautiful climb into Aspen! 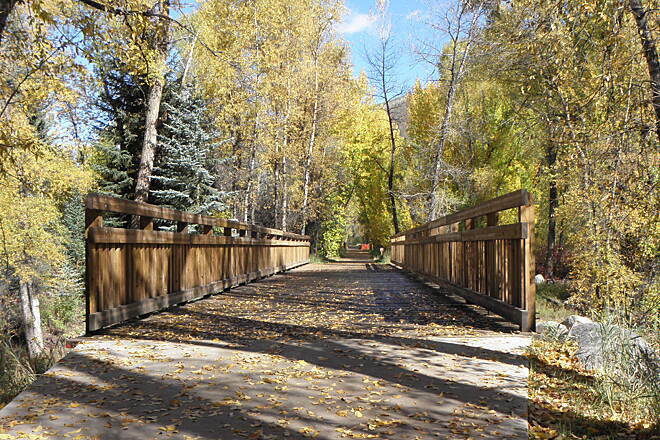 I rode this trail by myself in June 2016 on a brilliantly clear 98 degree day and seeing that I love riding in the heat I really enjoyed the steady climb up into Aspen. I started in Carbondale, parking in a marked public parking lot next to the trail and the police station. I and some others had to wait for bears to leave the trail between Carbondale and Basalt. I carried 2-21oz insulated water bottles because I had read on this site that water is not available along the trail, they were right. Be aware that there are no restroom facilities beyond the Basalt area for a stretch of probably 20 miles until Aspen so take my mothers advice and go whether you have to or not and be aware that there is a 3-4 mile stretch of hard-packed dirt, sand and gravel leading onto Aspen that my 23mm tires traversed without incident. There are views of the beautiful Mt. Sopris and much of the trail is along the impressive Roaring Fork River and a lot of big, clear blue skies. I would call the 30+ mile steady climb from Carbondale into Aspen at 8,000' "enjoyably challenging" but not killer for an fit 59 year-old aging triathlete/cyclist who lives and rides at an altitude of 500' in Virginia. 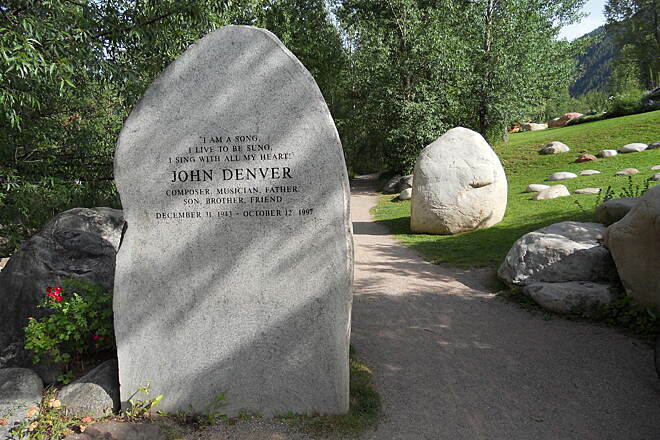 A trail tidbit, the beautiful John Denver Sanctuary Park in Aspen is right on the trail and has modern, new full bathroom facilities and fountains for refilling the water bottles, washing your face with cold water, etc. I rode around Aspen for an hour or so sightseeing and people-watching the beautiful people shopping and walking around the quaint town and then headed back downhill to glide back to Carbondale. It was a perfect day to put a very beautiful 68 miles on my bike computer. 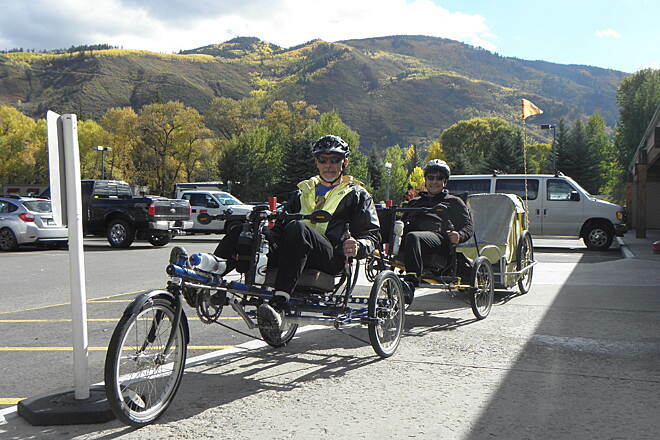 Note that there is an all-day RFTA bus service with bike carriers that runs between Glenwood Springs and Aspen and points in between that you can use if you desire. Just a fantastic scenic ride. As of 6/29/16, there is a section closed due to mountain lion activity. (About 3 miles south of Carbondale on the way towards Aspen) This closure wasn't too much trouble, there were signs to lead me on a detour. Not the most interesting of trails with respect to turns. But I suppose that's due to the old railroad line it follows. 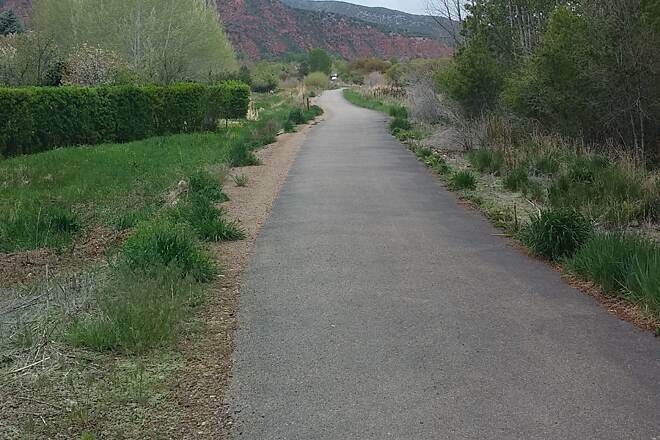 We picked up the trail in Carbondale, rode to Aspen for dinner, then continued about 6 more miles to camp at Silver Bar CG, on Maroon Creek RD for a first day total of 36 miles. 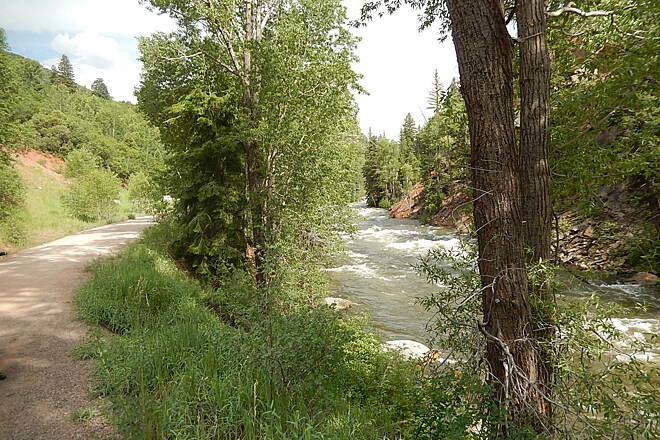 The trail is a long gradual climb past large ranches, and follows the Roaring Fork River. 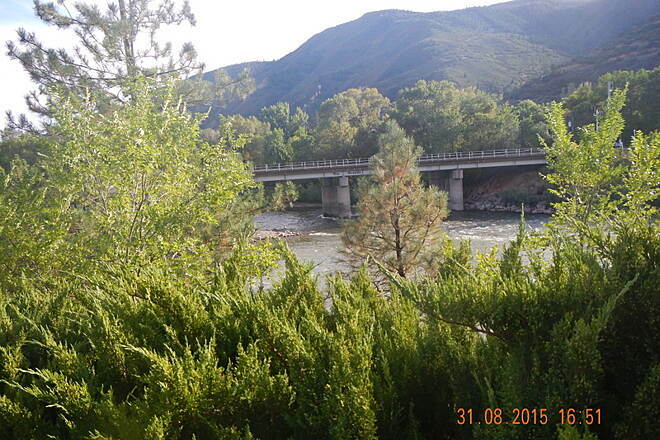 The river is often so close and loud you don't notice HWY 82 is close. There are intermittent patches of shade, but also very long stretches of blazing sun. The trail is VERY WELL marked and cared for with little use on our Tuesday/Wednesday trip. 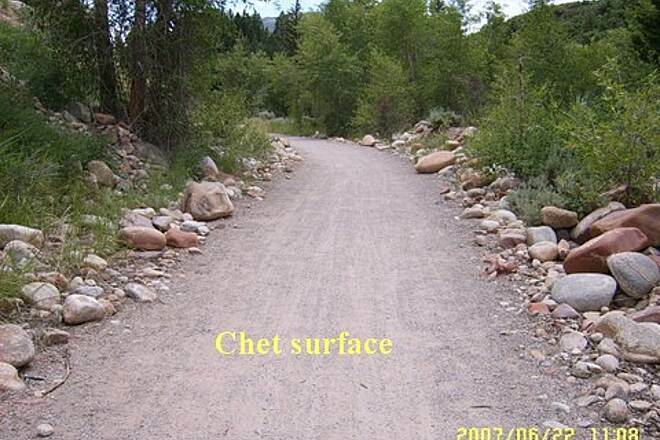 In Aspen the trail turned to packed crushed gravel, ok for road to mtn bike tires. One outhouse near Basalt and no drinking water or towns on the trail. We where visiting from Florida. Had already read about the trail and the fun towns along it. We where a little apprehensive about the Altitude and Elevation, but no worries. 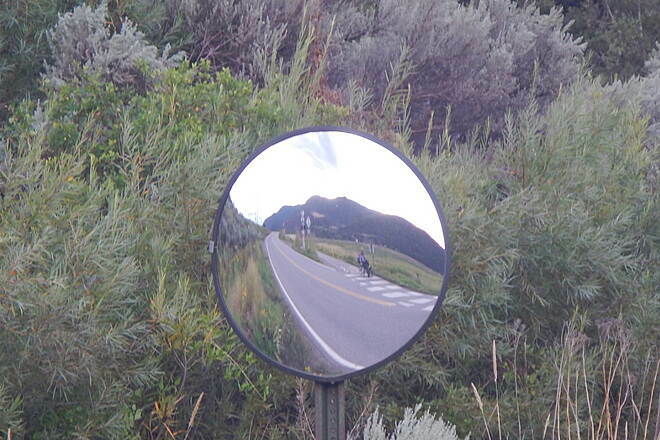 Rented Bikes in Carbondale rode up past old Snowmass. Stopped in Basalt for lunch on the river, then returned to Carbondale for the Evening. A big thank you to the rider's and volunteer's who keep this trail so clean. Did not see one piece of trash. 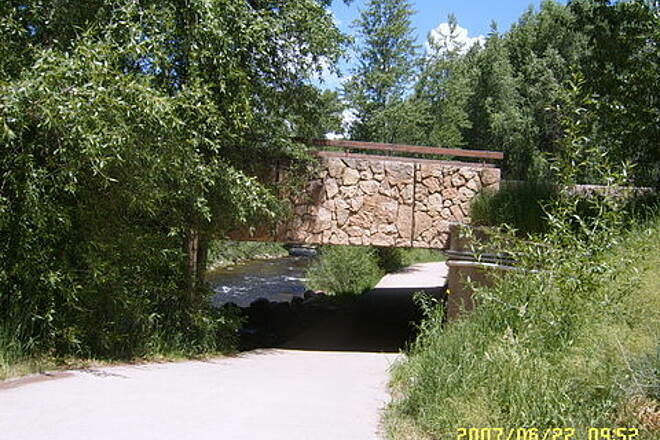 This trail is in a mountain valley and follows the Roaring Fork River and Highway 82. 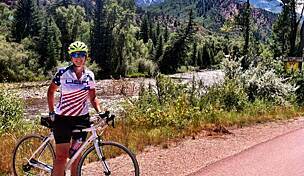 It is a 2200 feet elevation gain riding from Glenwood Springs to Aspen. The trail provides a great view of the mountains on both sides. I caught the fall color at near peak in mid October. As of fall 2014, 40 of the 42 miles are paved. The 2 miles of remaining gravel was nicely packed. 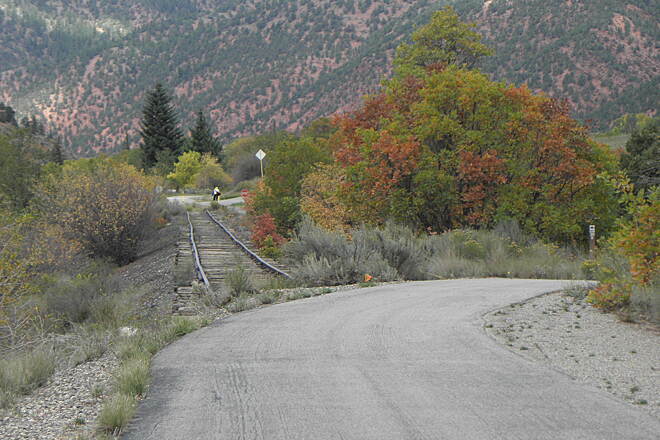 The stretch from Glenwood Springs to Carbondale is right next to the highway and has the most highway noise. Most of the rest of the trail is far enough from the highway that the noise is muffled. There are no drinking fountains on the trail so remember to bring enough water for your ride. 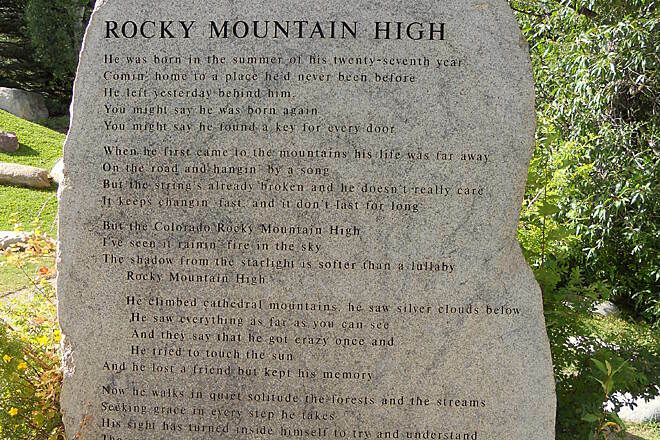 We started out at the parking area near the cemetery near 27th street in Glenwood Springs and traveled 10 miles to Carbondale. It was a steady uphill climb the entire way, so it was as far as we cared to go. We turned around and as evidence of the grade, we only pedaled a few times, coasting most of the way back. The trail was well maintained, but ran parallel to the road the whole way. 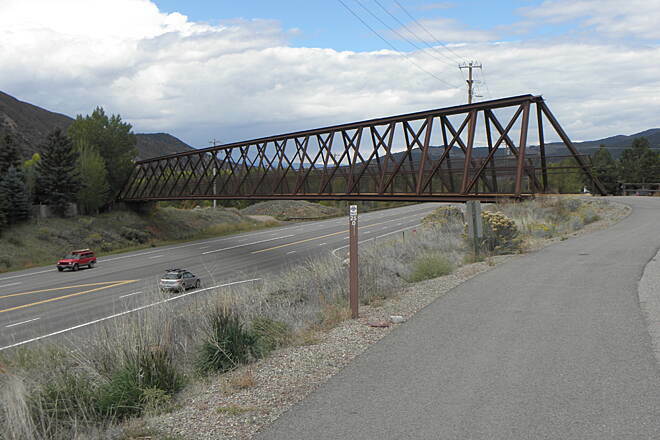 Next year we plan on parking and grabbing the bus at the 27th street transit center (rfta.com) and riding the bus to Aspen, then biking downhill the whole way back to Glenwood Springs. This trail will not disappoint. 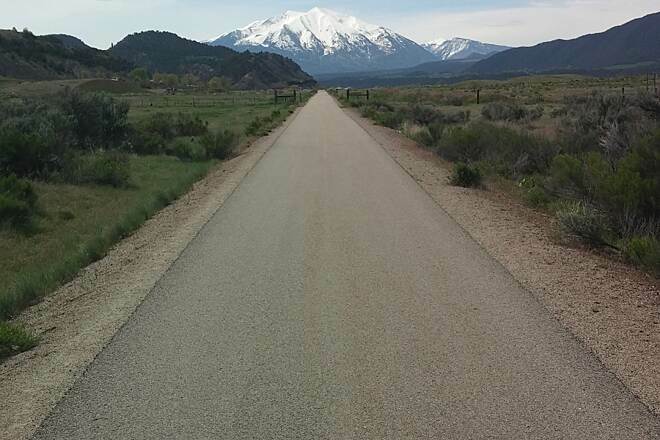 From the spectacular views of Mt Sopris to the roarin' Roaring Fork, this trail is meant for those who want to be outside. Families, intermediates, actually everyone who loves to ride, don't miss this one. Ran this over the weekend and was astonished to find the trail so flat but provide such wonderful mountain views. 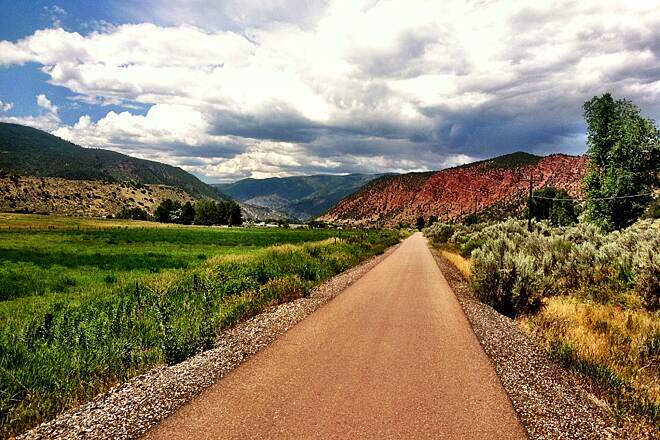 Glenwood Spings to Aspen and back. I rode this trail a week ago. My ride was from Glenwood Springs to Aspen. I camped over night and rode back the following day. I never did find the trail boring. It was beautiful scenery all the way. The ride to Aspen was pretty easy, however the last 10 miles or so has a few short, hard climbs. My ride was on the weekend, so roadies were a bit of a problem. 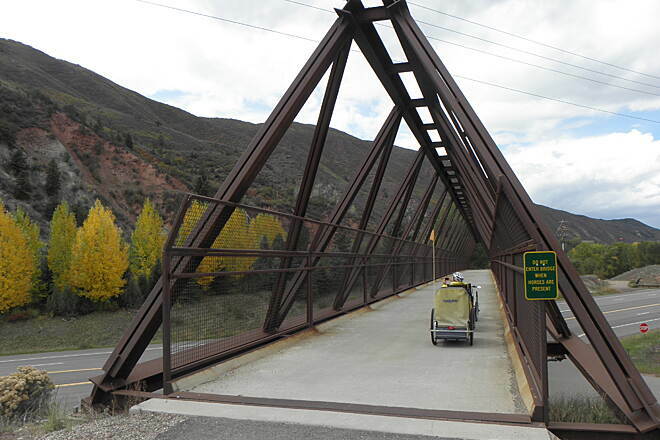 The return ride to Glenwood Springs was an easy downhill ride. I would recommend this one to everybody. We rode this trail while on vacation in the area. 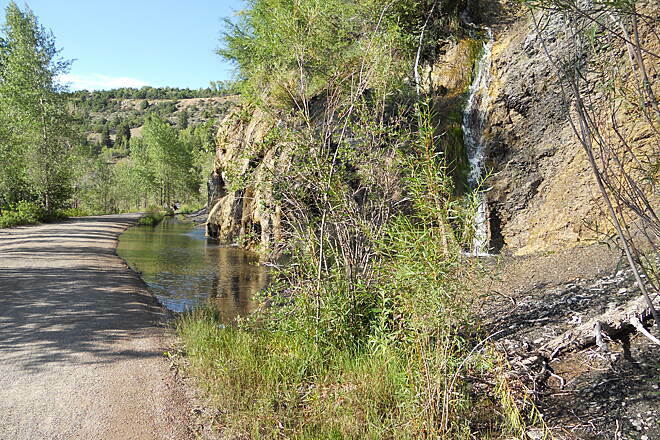 as recreational bicyclists, we were a little apprehensive about how we do on this trail. From our hotel we started at Two Trails Park in Glenwood Springs and connected easily to the Rio Grande on the edge of town. There are road intersections so you do have to be aware of cars until you get well out of town. The ride up valley to Carbondale is lovely and while a steady uphill grade, it's a nice morning workout . 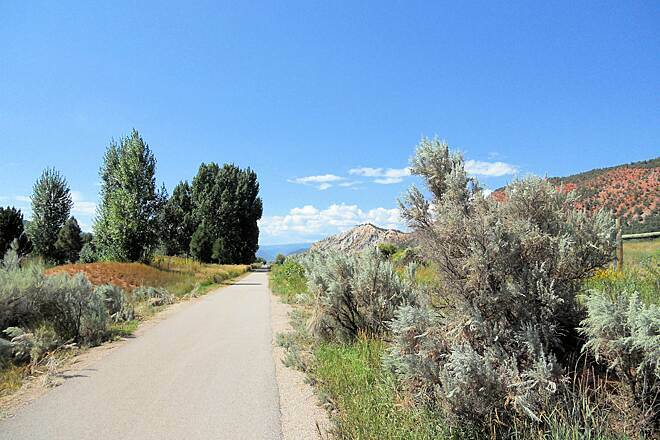 Arriving in Carbondale, you do have to look around for the trail as it is not well marked and to cross a couple of streets, but we just looked for other cyclists and found the trail back pretty easily. Carbondale downtown is really close to the trail, making it easy to stop for lunch on the way down. From Carbondale to Hooks End is gorgeous scenery. This was a good stopping point for us and made for an amazing 43-mile RT journey on day 1. 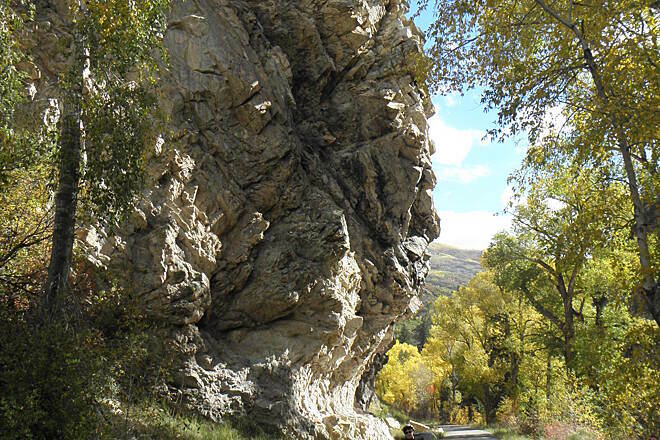 On Day 2 we drove to Hooks End trailhead and then headed up valley on bikes toward Aspen. 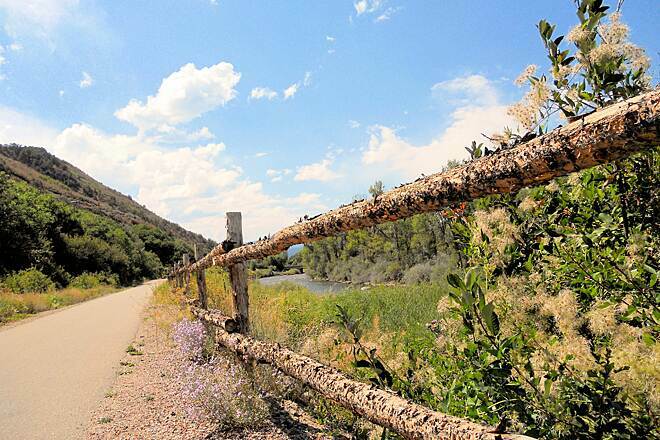 The trail inclines slightly steeper than the Glenwood Springs to Hooks End section, but still manageable for recreationalists. There are all ages and levels of cyclists, runners and walkers on the trail, from racers who ride faster up valley than we would ride down, young ones on bikes with training wheels, and even fisherman headed for their favorite spot on the river. 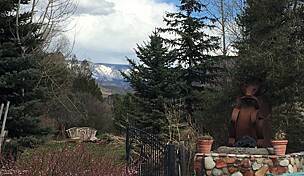 We watched horses, rafters, fishermen, golfers and saw beautiful homes and ranch landscapes. The trail detours just before Woody's Creek and we got directions from local cyclists to find Woody's Tavern which provides a welcome respite for cyclists and marks the spot that reconnects to the trail toward Aspen. We turned around at this 13.5 mile point (from Hooks End) and headed back down valley. 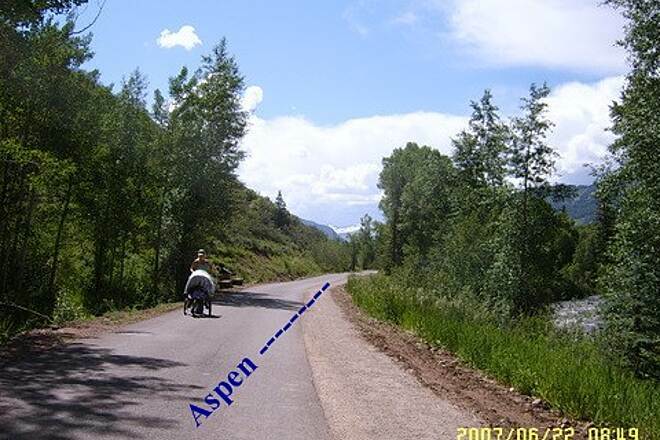 We would like to ride the last leg up to Aspen one day. 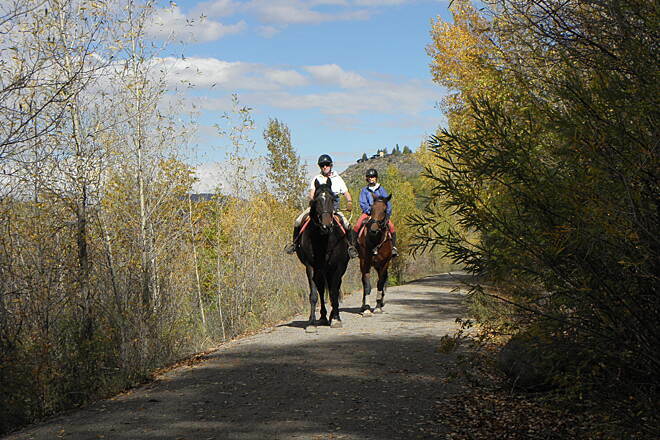 Rio Grande is an awesome trail and we would do it all again. Be sure to take water, snacks, sunscreen and be prepared for the occasional vault toilets. 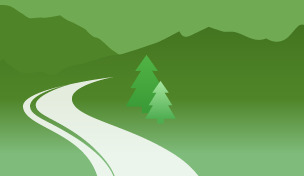 There are some towns along the way, but if you don't want to detour from the trail, then comfort services on the trail are limited. The trail is mostly well marked, but just look around or watch others along the way in a few spots where it's not so obvious. Highly recommend this trail. Cycled this entire trail in July 2013. 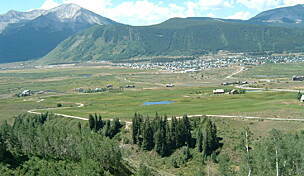 Did the uphill run one day, from Carbondale to Aspen which was beautiful and the downhill coast was great! The next day I did Carbondale to Glenwood with an extension in to Glenwood Canyon. That part was not quite as scenic as the upper portion. Only problem with this trail is that there is no drinking water available and trust me, you get very thirsty when you're cycling this route in July! Also after Basalt (heading to Aspen), there are no toilet facilities - save for one which entails going off the trail down a LONG hill & then back up. I'd give it 5*'s if there was drinking water & more rest areas. But if that's not a problem for you, the scenery and serenity makes this a great ride. In three weeks of cycling all over Colorado, I found this trail to be the low point. It's dead flat, dead straight, and dead boring. Admittedly I only rode about 3 miles of it (right out of Basalt), looked at what lay ahead, then skedaddled. Every other cyclist I saw was in aero bars working on their triathlon legs, so that tells you how interesting the path and the countryside is. It may get wonderful elsewhere. And for a family looking for dead flat dead straight, it might be perfect. The scenery is also uninspired--flat dry valley full of dull brush. Perhaps I expected too much, coming off the magnificent Glenwood Canyon Trail the day before. There's a trail with everything. Absolutely beautiful and absolutely perfect! Having ridden many great trails, I cannot say enough about how great this trail is - it may be the most beautiful trail in Colorado. My husband and I rode it last Sunday and I could not have been more impressed. 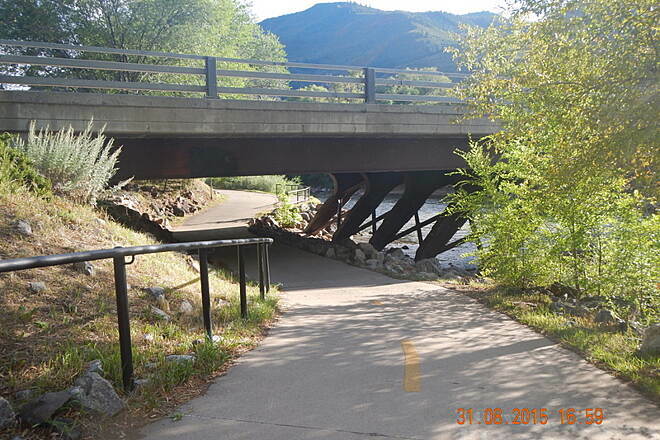 The ride along the Roaring Fork river is wonderful, and having a "Bicycling Friendly Community" (Carbondale) along the route made it all the better. We made it to El Jebel, where mudslides have unfortunately taken out about a mile of the trail, but we look forward to getting all the way to Aspen sometime soon. 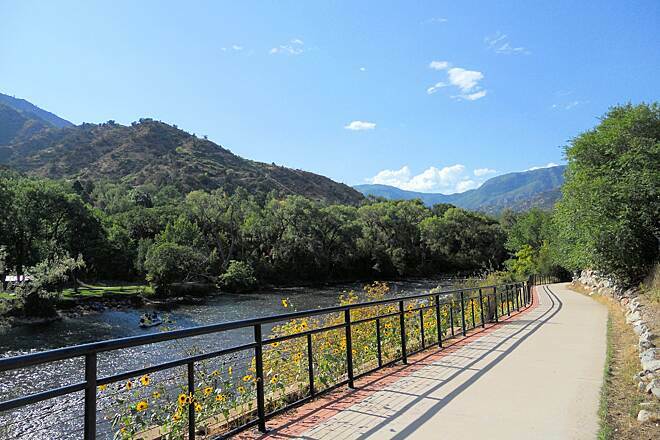 It's worth mentioning that in Glenwood Springs, near its northern end the Rio Grande trail connects to the older Glenwood Canyon trail running east about sixteen miles, It parallels I-70 and Amtrak through one of the most spectacular whitewater canyons in the county. 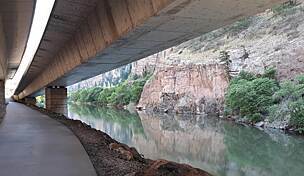 The canyon is so narrow that in places the bike trail literally hangs off the freeway and above the water in a uniquely weird and beautiful blend of nature and technology. 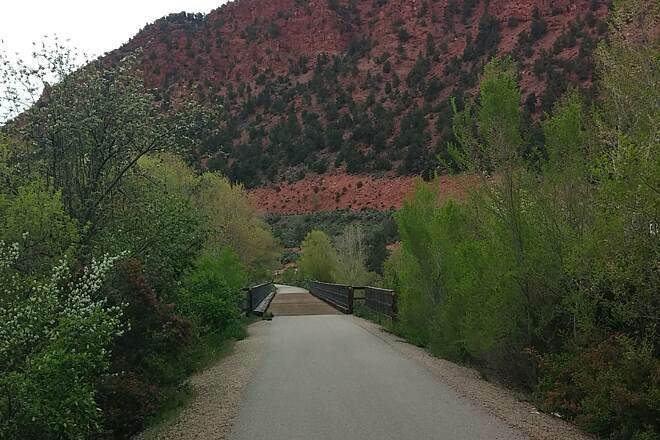 If you want to ride this trail one way, a Glenwood bike shop offers shuttle service back through the canyon. 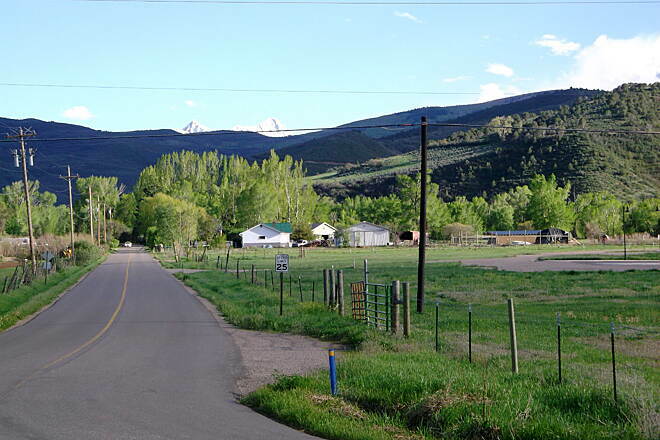 One way from Aspen, the total ride is about sixty miles with the first 44 mostly a gentle down hill (vertical drop is around 2500 feet) and the last 16 a gentle uphill (vertical rise around 400 feet). Fortunately, the wind is often at one's back on that last 16 miles. Take the shuttle back to Glenwood and the RFTA bus back to Aspen and it's a great day trip for moderately experienced riders. 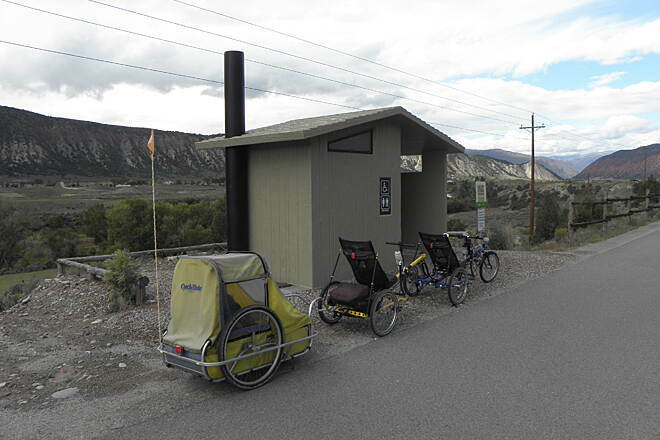 If you want to stay overnight and ride back as well, the nearest shopping and lodgings are in Gypsum, another ten miles past the end of the Glenwood Canyon trail head. 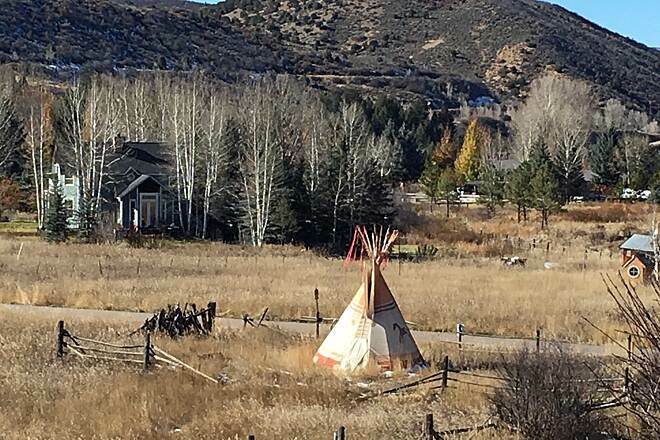 Better to park at the eastern trail head, ride to Aspen, where food and lodging are abundant (and expensive) and return to the trail head the following day. This trail has grown! 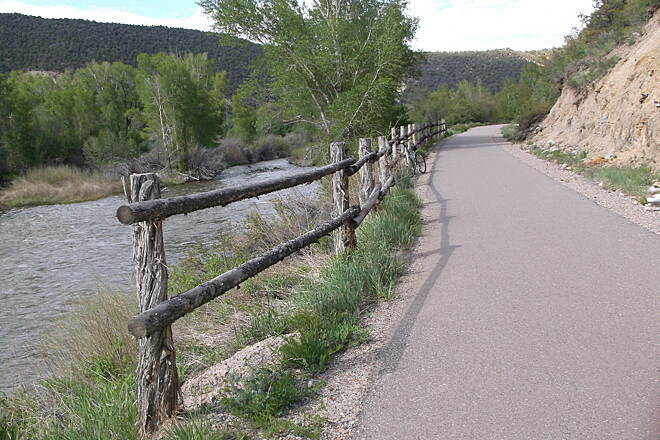 The trail is now 40 miles or so, stetching from Glenwood Springs, through Carbondale, then onto Basalt and Aspen. Paving with asphalt for the northern 30 miles or so has just been completed, with a Grand Opening ceremony later this month. 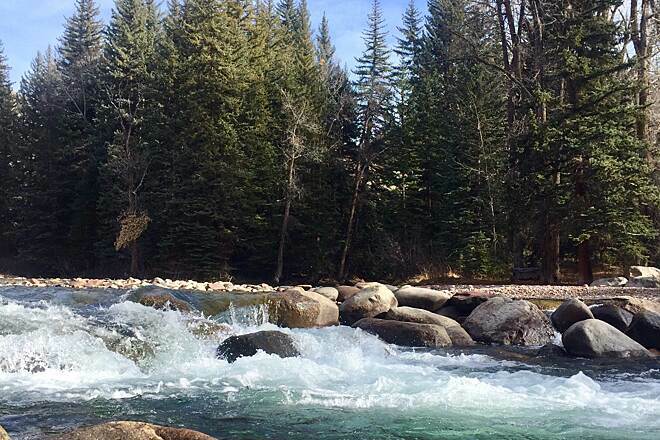 The first couple of miles north of Carbondale and the 10 miles south from Carbondale are pristine, following the Roaring Fork river for much of the time, with very few road crossings. 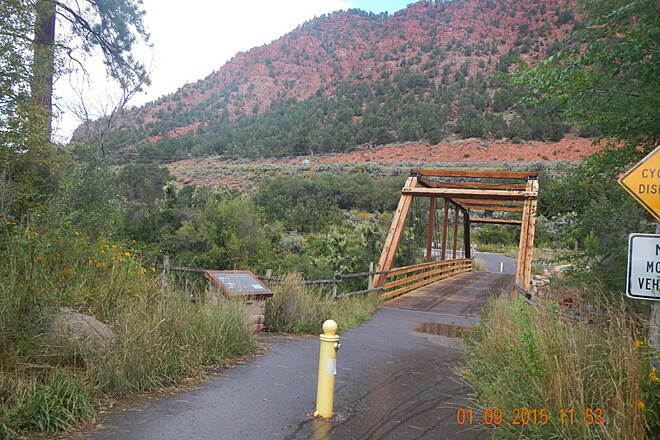 There is a gorgeous bridge crossing the Roaring Fork just north of Carbondale. I've ridden numerous rail-trails over the years, and this trail ranks right up there with the best of the best at this point! 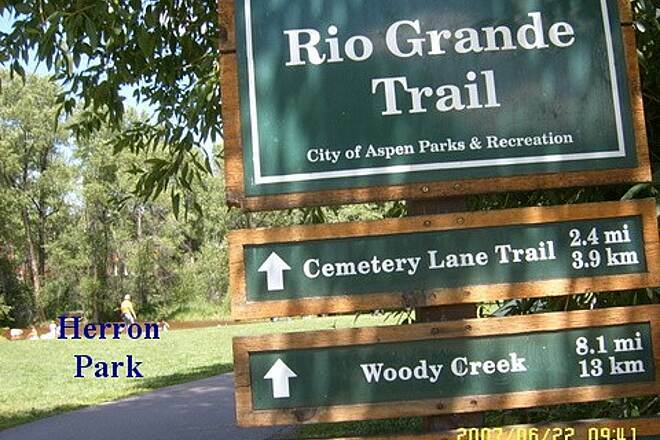 At Aspen the best parking for the Rio Grande Trail is at Henry Stein Park on Cemetery Lane at N39.21108 W106.83988 elev 7746’. 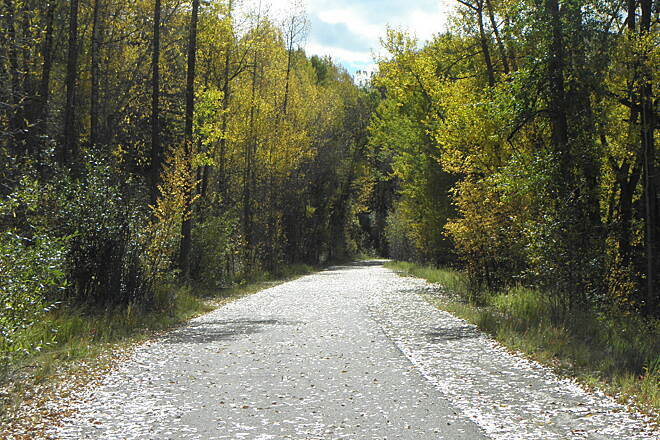 The trail is asphalt for 2.4 miles into Herron Park, and Chet 5.7 miles to Woody Creek. By Noel Keller 22 Jun 2007. "July 11, 2005: We agree with all the other reviews – wonderful trail. Paved from Aspen Visitor’s Center for about 2 miles, then well maintained, packed gravel that we were comfortable riding on with our street bikes. About 5 ½ miles out we turned around because we ran out of shade, scenery and curves. 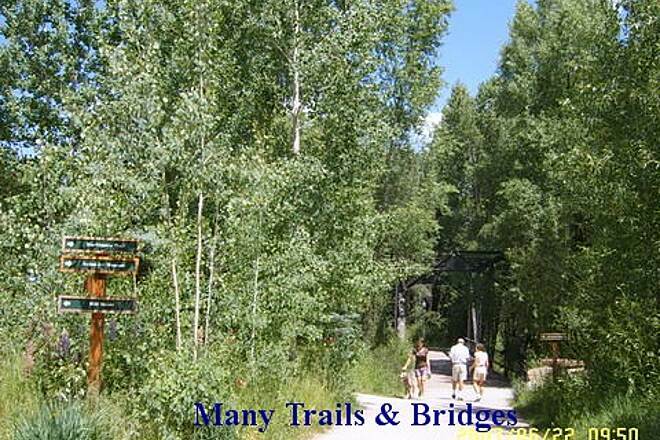 Visitor’s Center in Aspen was very helpful and have an excellent trail map for the area." 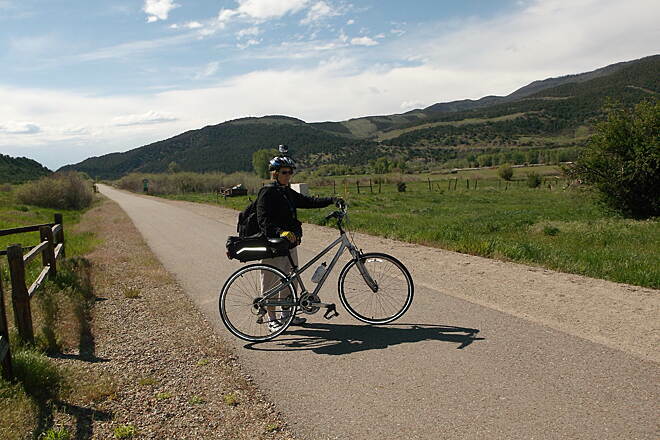 "This predominantly downhill trail from Aspen to Basalt was the perfect entry for my wife and I into biking. We rented bikes at a bike shop that was basically at the trailhead in Aspen. This shop provided an excellent trail guide that explained all the twists and turns of the trail. There we about 4 uphill segments that proved to be tough for us as beginners. We stopped at Woody Creek Tavern for some help with my wife's skinned elbow from a mishap earlier on the trail. They were very glad to help us, and we felt bad that time would not allow us to stop. 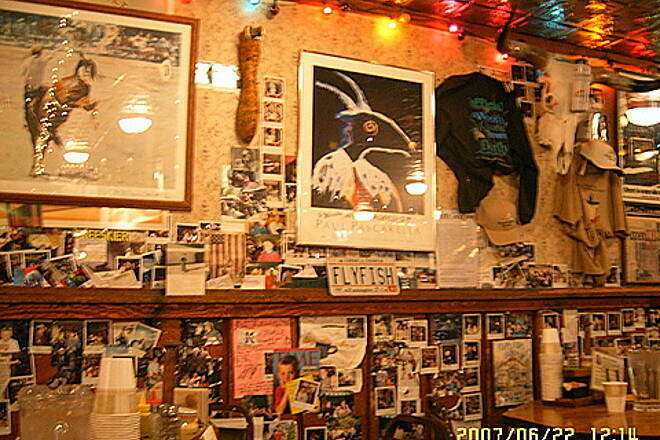 Their menu looked interesting and moderatley priced for the Aspen area. We later stopped by the trail for a picinc lunch. Take your camera for sure, but be careful; the scenery is so beautiful that you will be tempted to take your eye off the trail. When we arrived in Basalt, we waited 30 minutes for the RFTA public bus. Each bus has a rack for 4 bikes. After a 30 minute bus ride we arrived back in Aspen with just enough time for the short cross town ride to the rental shop and to meet our 4 hour rental period. It's definitley a winner of an experience." 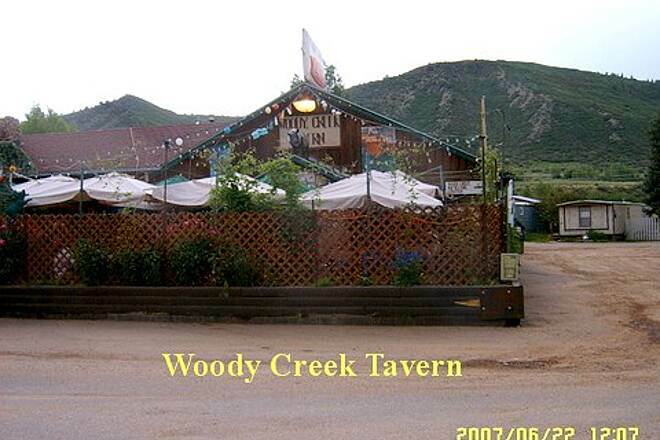 "Woody Creek Tavern is more or less at the half way point of the Rio Grande Trail. 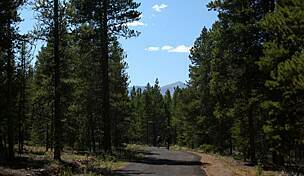 The trail is paved from Basalt to Woody Creek, and mostly unpaved but easy to bicycle from Woody Creek to Aspen. It is largely flat, though slightly uphill from Basalt to W.C. Tavern. This is a fantastic and beautiful bicycle ride - hard to overstate how wonderful it is!!"